For various reasons, I'm looking at reducing the total amount of shelf space I have that is devoted to holding up old game boxes. Some I will keep for nostalgia, for collection, or just because I know they'll be fun to play again. Others I've tried before, and regretted the experience. I doubt I'd want to give them another shot. But there's still the vast set in between those two poles, where I haven't even taken the jewel case out of its shrink wrap. So in the interest of giving them a fair shake, I'll be trying one game a night for the foreseeable future. If I like it enough in that short span, I'll save it for later. If not, well, I can probably get a few yen for them at least. This is a game by Xing, a studio no one has probably heard of. These guys did make one game I liked, Meremanoid, even though I still scored it kinda low. I'm not sure what's going on exactly, because the game relies on scrolling pages of lore peppered through and through with proper nouns lacking context. All I can say for certain is that the main character is a prince on the run, and that there are a ton of monsters. This is the odd part. Each stage of the game is an 8 by 8 map with a set number of monsters to defeat and towns to defend. While it's billed as a strategy RPG, it's a lot more like a board game with a dash of tower defense. The party moves from space to space, occasionally encountering chests, dungeons, or spots with limited visibility, all the while trying to keep the region's towns in one piece and reducing the local monster population to zero. Monsters have associated colors: red, green, or blue. The game keeps a scorecard of how well the player does in each mission, tallying up points not just for killing monsters, but for killing them in specific orders that match up to the right color combos (with a helpful reference screen available from the combat menu). While it's certainly a unique little game, I'm not really interested in the skeletal plot, and the odd mission format is hard to quantify as a plus or a minus. Asuncia is an experimental title, and it sort of suffers for that. Not keeping. ...I will be keeping Meremanoid, though. For the record, not sure if that's the best way to write out the title. According to GameFAQs, "Reveal" is the official way to spell リーヴェル, but the two words have opposite stress patterns. So, this is a game about fairies. Apparently back in the days when the world was young and everything was nice and peachy, humans and fairies lived happy lives together, but in more recent times the majority of humans have forgotten that fairies ever really existed, and most fairies prefer to keep hidden. The heroine of the story is Mariel, who comes from a line of fairytellers, people who have maintained ties with the secret denizens of the woods. Her father was quite an accomplished fairyteller, but unfortunately he's been off on a journey for about six months with no word of when he's coming back. On the night of the village fire festival, a cat in a smart jacket appears at her doorstep to inform her that Dad borrowed money from his company, and that the Boss is calling in the IOU now. Unfortunately, that's one thousand gold coins that she doesn't possess. Just from the intro area, the early-period PS2 3D graphics are... tolerable, but certainly not the best the system could produce even in 2002. It feels a little too zoomed in, which isn't helped by the iffy camera controls. The entire opening sequence of events is voiced... right up to just before the cat shows up. Then everyone goes mute. This was unfortunate, because the voice-acting was pretty good (if you like anime-cutesy). After a bit of an argument between the cat and Mariel's BFF (Best Fairy Friend), a time limit is set to repay the loan, and Mariel agrees to show the cat her father's workshop up on the hill. So they all set out and.... the game hits a black load screen to transition to the next area, and it's been stuck there for the last half hour. Sorry, little game. You were cute, you were interesting, but in the end you were also apparently glitchy as hell. Since the first game tonight was a bust, here's another! This is an old PS2 game that Nippon-Ichi published back in 2005. It is essentially an Atelier game without the RPG elements. The city of Tristaia, Jewel of the Seas, lies improbably low and isolated in the middle of the ocean. It was a hub of art and commerce like no other, right up until the time a dragon attacked it, about 11 years ago. Since then, it's been in decline, and the burgeoning new mainland technology hasn't helped any. Desperate to kick-start his city into a new age of prosperity, the mayor hires the famed inventor Prospero Franca to come and create new wonders for Tristaia. Unfortunately, old Prospero is bedridden with a bad ague, so he sent his darling granddaughter Nanoka instead. The mayor was... not very happy about this. Fortunately for Nanoka, she manages to impress a local woman of some importance when she decides to fix the big fountain in the center of town for no reason other than it was there. This title is an example of a pure meister game, with very little story and no RPG influences beyond the pseudo-fantasy / steampunk trappings. Nanoka can take a few actions everyday, doing things like researching items (to figure out potential uses) or making items that she's developed. Then she can sell them for profit at different stores in town. 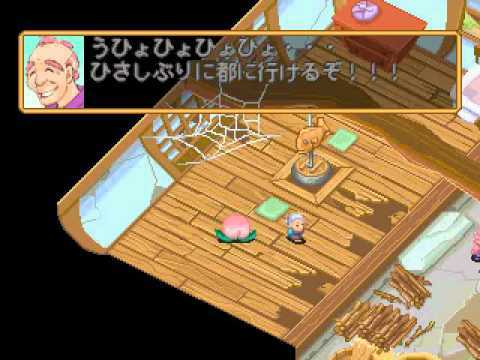 To be honest, without those RPG trappings, meister games can get dull quickly. I can't see myself finishing this one. Though it does get brownie points when, after Nanoka describes her new anti-cockroach concoction, the game flashes up a huge DO NOT TRY THIS AT HOME sign. I KNEW THERE WAS GAME FOR THIS. Picked up the anime (which I think was based off of this and I just was like "This seems like a game" Thank you for confirming. Which one are you talking about, Tristaia? Wish I had the fortitude to do this, however sunk-cost gets me and my backlog completion ETA is approximately 50 years, assuming I continue to buy games at the same rate with similar lengths and have similar amounts of time to play (actual ETA for existing backlog is 4 years). The average sunk-cost for me is about 3 bucks, since most games that I buy full price I complete. Most of my current backlog is bargain-bin titles that I thought looked interesting. I should have had this one up last night, but there were internet issues. So, this game falls within a very peculiarly Japanese sub-genre, the exchange student super-power fantasy. I reviewed a different game in this sub-genre earlier this year. Other games of this type would include Tokyo Majin Gakuen and the later Persona titles. Everything centers around this one semi-secret school for teens with mystic abilities, who are trained to combat the Tenma, a group of extra-dimensional interlopers colloquially known as demons. At the very beginning, I could see the start of an incident investigation that introduced the main members of the school's Exorcism Club, but immediately after that, I was thrown into the persona of the new kid in town, recently awakened into magical power and then transferred to the school. This particular game is much heavier on the textual adventure side than it is on the battles. After the intro bit, I had to sit through a long school sequence that introduced pretty much the entire campus cast a second time, with only one simulated battle to break the pattern. It's pretty normal for a game in this genre to take a while to get to the action -- I recall spending an hour in Persona 4 before getting to the first battle -- but the pace in this one is just not as well balanced. It doesn't help that the interface is almost entirely geared towards the Adventure side of the genre gestalt, with menu-based movement, a first-person conversation perspective, and lots of talking heads. The most interesting aspect is the ability to choose an attitude in reaction to a conversation (any of eight options, mapped to the arrow buttons and XABY buttons) and getting a different response from people. While there is a lot going for this game, including loads of voice-acting and animated character portraits in conversation, this game is still a typical textual adventure title, with all the hackneyed writing and plotting that entails. It spends too much time setting up the trappings of school life and not enough getting to the meat of what makes this situation weird and interesting. Not keeping. I bought this one because the back promised a strategy RPG with a strong story. So far, that means pressing the O-button a lot while pushing through introductory dialogue scenes.... ten of them and counting at this point. No choices, no combat or other gameplay, just poorly delivered expository conversations. I'm not even bothering to read it at this point, because it would only take longer if I did. This is an old (circa 1997) PSX strategy RPG with art that just reeks of that mid-90s fantasy anime style. It also reminds me, all too unfortunately, of my time with Tales of the World: Summoner's Lineage, though at least it has some different things to fault it on. There's a big bad guy named Gaia who is wrecking stuff across the planet with his summoned hordes. The hero is a kid who's just lost his entire family to Gaia's servants, but in the midst of the destruction he receives a magic amulet that will let him bring into this world a summoner capable of matching Gaia. The basic premise here is that each side has a summoner who can summon troops up to an energy limit determined by the number of tower bases they control. A good strategy is to send a fast unit, like a unicorn, to pick up towers in the far corners of the map. The biggest issue with the game is one of scope. In effect, its scope is too damn wide. The very first maps are so big they could be mistaken for endgame boss battle maps in other strategy RPGs, despite the fact that the actual combat will be contained within only a small section of the map, most likely. The enemy AI does not aim to capture towers from the player, nor even to grab neutral ones if the opportunity exists, so a player who's aiming to claim them can reach a ludicrously high energy limit for summoning early on. In the first non-tutorial battle, I had upwards of 500 points of summoning power available, which meant I could field almost thirty units... and wow, it would have been handy to have some AI customization options for them, so I wouldn't have to worry about directing every single one each time. Much like with Summoner's Lineage, this is a game that was designed for its multiplayer potential more than for its story mode. A single map can take hours, just from the troop management alone. And the story... just isn't worth it. If you like competitive strategy games with huge maps, this would be up your alley, though. And one more for the night! The Farland series was one that got pretty wide sales on the PC, with some ports to Sega consoles, but this is one of the rare few that came to the PSX as well, as part of one of the discount title selections. It's certainly a bit better than that would imply. This game follows Karin, a young magician who's connected to the main series plotline in some way. This is definitely a side-story game, though, and a playful one at that. The first fifteen minutes or so are one long plot sequence with some decent spritework, more than decent animated sequences, and generally good voice acting. I think I'll hold on to this one, at least until I have a chance to try it again while wide-awake. This game's PSX debut was in 1997, but the developer's copyright goes back two years earlier, so I'm betting this was originally a PC-Engine game. It certainly has the look of one, with SNES-grade sprite graphics for its towns and overworld combined with really nice (and sometimes risque) splash pages, voice-acting, and a really nice-looking battle interface. A really long time ago, there was an evil black dragon who burned whole kingdoms to the ground and then ate the roasted flesh of the citizens, etc. etc. The peoples of the world banded together to create a weapon capable of slaying the dragon and presented it to a hero who, blade in hand, destroyed the fell beast once and for all. Shinobu is a young magician from a far-off land who is tasked with finding someone worthy of bearing the blade. After a shipwreck, she washes up on the shores of Grantzel, and must continue her quest almost completely from scratch, with only her mystic spell cards to keep her safe. This game feels a LOT like an SNES-period Final Fantasy title. Shinobu's sprite even looks a bit like Terra in a new outfit. The biggest difference is in the appearance of battles, which... y'know what, I'll just see if Youtube has anything on this one. And it does! From the PC-Engine version, no less! The graphical quality is a little different from what I'm playing, but otherwise it's about the same. This game is making me regret not clearing space on my PSX memory card beforehand. I'm gonna have to shut it off now before I get too far in. Definitely one to keep for later. 黒の剣 looks like one of those "straightforward" plots. Might be a fun game to look for the next time I go used games shopping in Japan. That's one reason it really clicked with me, I think. After the last few games, a title with a simple but cohesive plot combined with a quick trip to the meaty action was like a godsend. Oops, time to catch up a bit! The hero is Cristophe, at 250 years old the youngest of his vampire coven. For most of that time he's been chilling in the master's castle somewhere in Vaguesylvania, but now trouble has come in the form of Durant, a former member of the coven who rebelled and tried to destroy everyone a few centuries back. Durant's recently broken out of his prison, and now he's running around the town in the valley below. Cristophe is sent to go deal with him. The gist of the game seems to be that Cristophe and Durant both run around during the day, talking to people (who mostly just want to discuss recent undead sightings), but at night they show their vampiric colors. It's during the dark hours when they make "special visits" to people in their homes, hoping to gain converts to their respective sides -- all the while avoiding the vampire hunters. This is a game that could have used a bit more structure to its (completely nonexistent) tutorial section so I could have some idea what was going on before I completely lost all HP to a vampire hunter and yet still kept going. I'm still not sure why I didn't regain HP on the following evening, either. So... not worth the effort, I think. This is one of the odder entries in one of Square's odder series. Prince Whatsisface, hero of previous games, gets sent to a remote island because he's still a little brat, and has to prove himself worthy of getting home. On the way, he has to save the islanders from the depredations of the Hard-Boiled Horde. Battles are weird. It feels more like something for a smartphone screen, as the player directs the prince's squad of warriors at the enemy with quick flicks on the touch screen. He can also summon Egg Monsters to face off against the enemy's own champions. This game came out in 2005, making it one of the very earliest DS RPGs, and there is a whole lot of problems. The swipe-flick combat interface doesn't work too well with fingers (beyond the problems with getting skin oils all over the screen), and seems destined to cause major scratch damage with the stylus. The battle frequency is pretty high, and the battles aren't that fun. One other issue is the font. The game script looks like it was handwritten by a grade-schooler. I found it difficult to read, so I don't know how a casual importer in the US would handle it. This one should have gone over-easy, but it was just cracked and runny. Bye-bye, eggheads. I already find reading Japanese text on the DS, especially Kanji, difficult compared to on the PSP and Vita. Grade-schooler text on the DS sounds like a nightmare to decipher. This is one of those adventure games with occasional RPG-style combat, but in formatting and plotting it could have served well as an RPG in the same vein as the Persona and Devil Summoner series. It has many of the same elements, including exchange student hijinks, mysterious animal spirit guides (ethereal green Eevee! ), soul-sucking nightmares, supermentalists, and random ghost appearances, but it's shown almost completely in static location imagery and semi-frequent FMV and sprite animation sequences. Unfortunately, its graphic novel adventure interface makes gameplay highly contingent on reading skill, not to mention slow as molasses. It's all too easy to imagine it being redone with actual game sprites and a fully fledged RPG battle system, though. Two young soldiers are on patrol in a forest when a fairy rushes up to them and gives them a ring to deliver to their commander. Right as she faints from fatigue, imperial soldiers appear on the scene to get the maguffin back. Once they get back to the castle, the player avatar finds himself promoted up to commander of the nation's 9th Cohort, the newest (and smallest) branch of the army. Riot Star is a mid-90s PSX Fire Emblem clone with a few mechanical twists. It's a hex-based strategy title that makes use of squad tactics and special attacks powered by magic gems collected from completely defeating enemy units. The gems do not seem to carry over between missions, so it's a use-them-or-lose-them situation. This one might actually be worth holding onto for a while longer. I can't save right now because my memory card is full, but then again I probably should start over fresh so as to prevent some minor issues with manpower that I currently find myself in. Oh, and apparently there's at least one import gamer who likes this one enough to dedicate several videos to it on Youtube. Somebody needs to introduce him to streaming software, though. OK, take a bit of something like Star Ocean and cross it with a mid-90s Japanese sci-fi police anime (shades of Mihoshi and Kiyone from Tenchi Muyo. That's this game in a nutshell. And a nutty shell it is, too. Also very text-heavy with the usual graphic novel adventure interface hangups. Beyond the usual adventure game / relationship sim elements, there are the battles. This is where it really gets odd for a mid-90s PSX game. Players only really seem to control Randy, the new guy on the squad, which probably makes things a bit less complicated. At the beginning of a round, the player has to mark out a path for Randy to take, along with when, where, and how he makes an attack. When battle is enjoined, everyone (Randy, allies, and enemies) go into motion, and you'd better hope that the bad guys are where you told Randy to attack them. Long, dull, text-heavy scenes and interface, interspersed with a battle system that loves to drive the player to distraction. I think this one's going back to the store. Hmm, maybe some of the other Melty Lancer games might be interesting. I know I liked the premise from the Anime I own/watched a few years back but sadly it didn't go anywhere (was an OVA) probably to help promote the games. Not surprised that it was originally an anime franchise. The extremely long "let's introduce everyone right now" sequence should have been a tip-off. Feat is a young spiritualist who studies with his master near the eponymous Elder Gate, a mystic portal linking his own world with that of Eldra, where the spirits live. 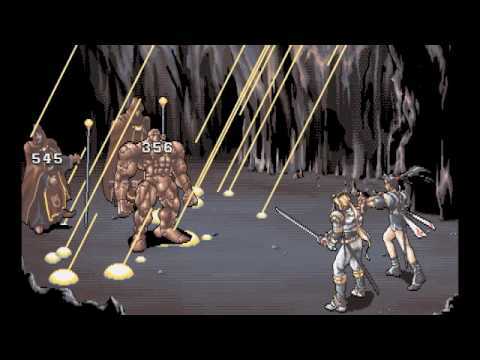 In the opening animated scene, the game begins explosively as the gate does just that. Now Feat has to cross the border between worlds to repair the damage to reality, fight monsters, and figure out what happened to his master. The gimmick to this one seems to be "personalized adventure". In other words, the world map for each trip through the gate is procedurally generated, and doesn't look half bad for that. The dungeons are just as bad as one might expect, though, and the plot is about as bare-bones as they get. If I weren't actively looking to get rid of games, I might hold on to this just to finish it one day, but... there really wasn't anything to grab my interest and hold it in the few hours I tried. Actually it wasn't an anime franchise first, it was a PC game it looks like. The Anime was made to sell the game (same with Tristia). Also looks liek what you played was the second game but I'm having a really hard time finding a good source of information for the games, only the anime since that did get a US release. OK, time to play catchup again! The start screen openly states that this is the first game of a trilogy. I don't really feel like seeing if Pioneer Studio actually made it all the way to the end. So, we have an evil empire moving in on a little upstart island nation, and a former military leader turned bounty hunter because of a past tragedy. It's pretty slow to start. This game works like a weird Fire Emblem clone built upon an RTS engine, which means that it's finicky and difficult to control everyone in a timely manner, has questionable AI for when you put people on automatic, and includes perma-death. This is not a good combination. I think it should be pretty obvious, but no, not keeping this one. I think this one was based on an anime, maybe? It's very, very steeped in classical Chinese stylings, to the point where every single character (and most of the items) require furigana notation so we know how anything is pronounced. The main character is a sort of Taoist sorcerer who's spent the last decade studying in a monastery. In ages past, the founders of that monastery were instrumental in the defeat of a race of ancient demons, using powerful artifacts of their own devising. Now, the MC has descended from the mountain at the request of the Old Master to investigate goings-on in the nearby kingdom. It's a lot worse than expected. The king's new bride is actually a fox-woman, almost the entire royal guard (those not quietly eliminated) are now serpentine or bullish yao-gwai servitors, and the king himself seems absolutely fine with this, getting his jollies off of public executions. (This one goes a lot faster at the start than most of the strategy RPGs I've played in the last week and a half). This thing is essentially a mashup of Final Fantasy Tactics and Romance of the Three Kingdoms. Characters level up weapons skill and gain new abilities on the fly, and the status attack skills are surprisingly effective. So... I think Flight Plan was trying a little too hard on the setting on this one. Black bat-winged masters own white-winged slaves, and everything that is bad is good, while everything good is bad. The hero wakes up from a months-long coma, having been cared for the entire time by his alleged owner, but after a minor incident in town, she admits in front of an official that she's in love with her white-winged not-a-pet, and that's a big no-no. Love is listed among the Seven Deadly Sins in this setting, along with Friendship, Compassion, Freedom, Justice, and two others I can't recall right now. So the MC gets sent to the prison of Gehennom to await a bloody execution for his philosophical crimes. With the help of some fellow inmates -- including a local Robin Hood, a bloody-minded master-slayer, a milquetoast (former) guard, and a necromancer -- he has to break out and make a difference in the world. Seriously, the way it's portrayed, the world of Black/Matrix lies somewhere between Disgaea's Underworld and Menzobarranzan on the sliding scale of messed-up dark mirror societies. -allied units do not automatically come with BP (Blood Points) for special attacks. These are gained by killing people, to be collected in a central stock which can be transferred to characters later. -the very first spells on the necromancer's list are Create Zombie and Corpse Bomb. Zombies (created from fallen enemies) only have 4 HP, but they also only take 1 HP in damage for any hit. A well-placed Corpse Bomb can take out the first boss in one hit. -tutorial bits end with a Yes/No question, which one might assume is the usual "Do you understand?" Instead, it's asking if you'd like to have it repeated again the next time you choose that item on the command menu. This is why EVERY SINGLE TIME I ATTACKED, I got the same five-window explanatory text about how the attack function worked. There is no second chance to turn the damn thing off. Seems fun, but the writers are really stretching the Good-is-Bad premise past the point of ridiculousness while at the same time not taking it as far as they really should (because no one wanted a Z-rating on a game in the PSX days). In the end, what decided it for me was the battle music. I just couldn't stand those drums for any longer. Goodbye, Black/Matrix +. Honestly, I picked this one up because it's one of three RPGs to feature artwork by Kohime Ose (the other two being Atelier Marie and Rowdy Princess, both of which I also own). At the time, I didn't realize that it had actually been released in the US under its secondary title Eternal Eyes (translation from Yuukyuu no Hitomi), or that it was apparently considered a bit of a stinker. In the big opening sequence, we first meet the crew of villains acting all villainous, with a former hero to torture and some conversations about awakening a goddess of destruction. Then we cut to a bunch of kids making plans to explore some caves. According to urban legend, there's an old naval ship moored somewhere in the caves below the town of Goondocks (Goonies reference!) that's possibly full of treasure. It's not, but by odd coincidence it IS the final resting place of the main characters' father, a Puppeteer who fought against the dark goddess the first time around, and a magic crystal which they can use to animate the old puppets back home into full-fledged Muppets (seriously, that's the Japanese word... and the English translation of Mappemon isn't any better). Apparently these things are the only force that stands a serious chance against the bad guys. It's a very, very simply TRPG, and comparisons to games like Rhapsody are probably warranted. I'm tempted to keep it, if only to give a counter-argument against the official review on the site, which is... not very objective. Just from looking at the back cover, this looks to be a game that combines roguelike dungeon designs with Wizardry-style combat and a lot of dice rolls.... and apparently it's made by Idea Factory? Do tell; was it as bad as Kweee's review would suggest? Because I definitely can say that I have played games that started off worse, looked worse, or had nastier control schemes. About two or three of each category in the last two weeks, in fact. I made the mistake of stepping out to get a drink when the opening sequence started, and found out too late that this game does not put automatic pausing between text boxes in a long string of lore. In fact, none of the text goes at what one might call a slow rate. The gist of the plot is that the hero is a young god from Taka-amahara, the Japanese upper realm who is soon to receive the magic bells that grant him his full power. He gets impatient, though, and opens the box with the bells too soon. All seven of the tintinnabulating things roll right off a cloud and down to earth, so now he has to go and find them so he can be a full-fledged deity. I'm trying to find a way to describe how this game looks, and the first thing that immediately springs to mind is some Flash game on Facebook, like someone's homemade MORPG concept. There's a wide, mostly open world to run around in, populated by scores of random citizens in a bizarre mashup of feudal and mid-90s Japan, e.g. old samurai gentlemen riding around in motorboats, that sort of thing. The graphics are very low-tech for something on the PSX, esp. for sprite graphics, but they don't necessarily bad. Just... well, Flash. The battles in this game are based on card game version of rock-paper-scissors, with point totals and modifier cards affecting how much damage one does to one's opponent. There's a little icon over the heads of people who can be challenged, but no indication of how strong that person might be... which is very unfortunate. This one feels more like a hassle than anything else. I think I shall pass on it. The heroes are the crew of a Galaxy Guard patrol ship. First level pits them against a crew of pirates. The boss creamed me. You have a three-man party, each with their own HP, but energy weapons share a shot pool. One character has blade attacks for when there's no ammo. Maybe it was just me, but I found it very hard to alternate between dodging and firing, and the targeting reticle took too long to aim properly. Standing one's ground and firing till the enemy is dead is not a good idea either, cf. my comment about the boss. I don't really have the skillset to succeed at this one, so I shall let it go. I couldn't really figure out what I was supposed to do with this one. Maybe the late hour and my headache had something to do with that, but I just couldn't take an interest in any part of what was going on. The polygon-rendered character sprites were pretty bad too. I gave this game's sequel a pretty bad review... and yet I still have to say that it was an improvement. When I said "not objective" I mainly meant not conforming to the site's current standards of semi-professionalism. If someone handed me that review to proofread prior to posting, I'd ask him/her to rewrite it. The thing reminds me of something Otter might write, and that's never a good sign. I will admit to only playing like part of the first 3 levels and not being grabbed by it. Although for SRPG's I admit I love them but they have to really hook me good to get me to play them. Part of the reason why I have beaten Disgaea 1 and Disgaea 4. The characters totally grabbed me.